Think back to 1986 when Bo Jackson decided to play baseball instead of report to the Tampa Bay Buccaneer organization. What could he have accomplished had he donned that uniform?? Would he have become one of the all time rushers and turned around a moribund franchise?? Or would he spend the bulk of his career playing in relative obscurity as Corey Dillon did in his?? It’s still interesting to think about when we think of the career of Jackson. Most observers hold on to the what if scenarios over what other players actually performed on the field. 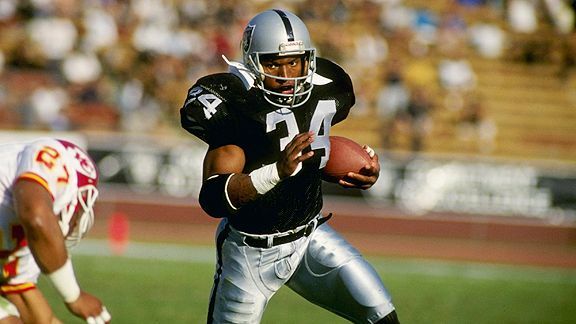 The Chancellor doesn’t but what can’t be underscored was the impact he had when the Raiders decided to pick up his rights in the 1987 NFL draft. Yet they had to wait until he finished off his MLB season first. The 1987 LA Raiders were an aging fading team in need of a spark. They were light years away from the ’83 group that won Super Bowl XVIII and were in the midst of a 7 game losing streak when they traveled to Seattle on a Monday night. Although it wasn’t a scintillating match-up, this was the first chance for a nation to catch the former Heisman winner playing his “hobby”. The problem was we were left without knowing the best Bo could have been. He could have broken records or he could have just been a good pro. The player that he reminds me of most is Herschel Walker. Another former Heisman winner with a super man type body. Most straight line power runners wear down against modern defenses. There are some exceptions and Bo could have been one of them. Make no mistake about it he had the potential to be one of the biggest stars in NFL history. Yet we didn’t get the chance to see it and that’s the problem. We’re stuck in a gray twilight of what he could have been. This entry was posted in Legendary Days and tagged Auburn Tigers, Bo Jackson, Bo Jackson & Brian Bosworth, Bo Jackson vs Brian Bosworth, Bo vs. Bosworth, Brian Bosworth & Bo Jackson, Brian Bosworth vs Bo Jackson, Brian Bozworth, football, LA Raiders, NFL, sports. Bookmark the permalink. There has NEVER been anyone to have THAT combination of speed and power, EVER!